Do I have a time limit to complete the course? Is there an expiration date for the certificate? Can I contact a Driver's Ed Instructor? What if my computer crashes, will my work be lost? How can I contact Safety Driver's Ed? How old do I have to be to sign up ? We recommend that you are at least 15 years old to enroll in SafetyDrivers Ed. The price is $59. This price includes the certificate of completion. We offer free standard mail delivery. You have the option to upgrade mail delivery service. No, there is no time limit to complete the course. You may take as much time as you need. No, there is no expiration date for the certificate of completion. If you lose your certificate of completion, you may request a duplicate certificate. The fee is $20.00 for a duplicate certificate. Also, complete legal name must be typed on the certificate, as prompted in the "Certificate Mailing Options." 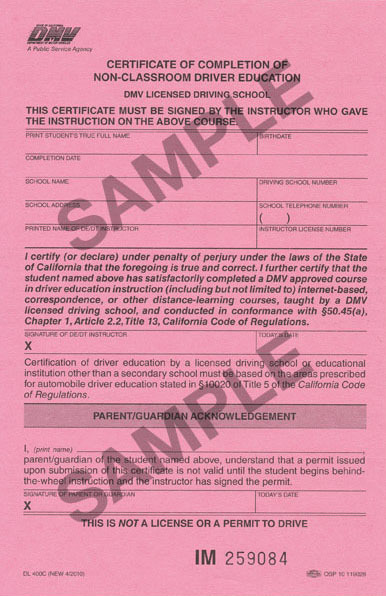 Yes, you may contact a licensed Driver's Ed Instructor. We are here to assist you with any questions you may have. You may contact the instructor by email or telephone. We understand that the content of some videos may be graphic; therefore, we do not require you to view the videos. Graphic videos will have a "Warning." The video must play in it's entirety before you are allowed to advance to the next page. Each test requires an 80% score or better to pass. If you do not pass the test, simply take another test, until you pass. You may review any sections in the course. There is no time limit to complete the test. We recommend a Windows or Macintosh computer with Internet Explorer 5.5 or higher, FireFox 1.0 or higher, or Safari 2.0 or higher. You will also need Flash version 8 or higher. If you are unsure about your computer, you can always sign up for free and view 25% of the course without paying. If your can see the first few pages of the course, your computer will be fine. If your computer crashes, you will not lose your work. Your records and progress are saved on our database. You may access your personalized driver's ed homepage from any computer that has an internet connection.